The individual plots consisted of a mix of Kentucky bluegrass and annual bluegrass with small amounts of perennial ryegrass which had been over seeded. The plots measured 30 square feet (6′ x 5′) with a one foot buffer between each plot. The products were applied with a CO2-powered wheeled sprayer equipped with Tee Jet 80015 nozzles and sprayed at 30 psi producing a total spray volume of two gallons per 1,000 square feet applying a 5-foot wide swath. Walking speed was calibrated using a Korg MA-30 metronome. Percent disease and plot quality ratings were taken on March 9, 2010 (13 days after snow melt) and then again on April 7th. Permanent snow covered the plots for 80 days: from November 25th until January 12th and then again from January 22nd until February 24th. Data was subjected to analysis of variance using a randomized complete block design with 4 replications. Differences between means were separated by Fisher’s Protected LSD at the 5% level. The disease pressure was light. On March 9, 2010, the untreated plots and Penstar FLO (12 oz/1,000) averaged 9% and 2% disease cover, respectively. All other treatments provided 100% control. By April 7, 2010, the disease cover had decreased for the above treatments to 0.9 % and 0%, respectively. 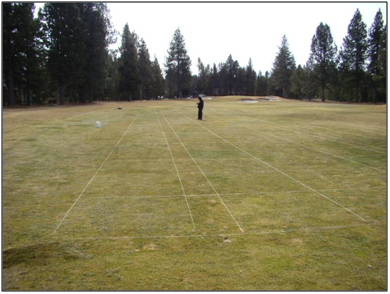 All of the treatments in this trial had acceptable turf quality. Even though the untreated plots had some disease on March 9th and rated 3 on that date, by April 7th, the disease was nearly gone and the plots had recovered to a rating above 5 and the course had not yet opened to play. Our only advice is to look at the photos carefully and make your own rating adjustments if you deem them necessary. On March 9th, 13 days after the snow cleared, seven treatments rated above 6.0 in turf quality. All of these treatments included StressGard, a blue-green pigment that darkens the turf. In fact, treatments 7, 8, & 9 included Interface and Triton FLO which both have StressGard in them, in essence, applying a double rate of the pigment. Interestingly, by April 7th, the darkening effects of the StressGard were wearing off as the turf quality ratings on those plots generally decreased one half to a whole point in color. ** Note: All 4 treatments included IPRO 2 SE at 4.0 ounces per 1,000 sq. ft.
Generally, the two treatments with propiconazole performed better than those with myclobutanil. The plot quality for the two treatments with propiconazole was not significantly different than Instrata applied at 9.3 or 11.0 ounces (Trt 15 & 16), Penstar FLO applied at 12 ounces (Trt 21), and 26GT + Daconil Ultrex applied at 4.0 and 5.0 ounces, respectively (Trt 22). Additionally, the plot quality for the two treatments with propiconazole was not significantly different than the two 3-way mixes (Trt 23 & 24) of Penstar FLO + 26GT + Daconil Ultrex (8.0, 4.0, and 5.0 ounces), and Banner Maxx + 26GT + Daconil Ultrex (2.0, 4.0, 5.0 ounces). It is important to note that the chlorothalanil rate for treatment 19 was 1.5 times higher than the rate for treatment 24, which may account for the slightly improved turf quality. Comparing plots treated with mixes including QP TM/C vs. QP Chloro 720 show that plots treated with QP TM/C rated slightly higher (but not statistically different) on April 7th than plots treated with QP Chloro 720. However, these treatments were essentially the same on March 9th. Treatment 20 [QP Chloro 720 (5.5 oz/M) + IPRO 2 SE (4.0 oz/M) + Myclobutanil (2.4 oz/M)] rated only 4.1 on March 9th and was significantly worse than treatments 17, 18, and 19. However, by April 7th, treatment 20 rated 5.1 and was not significantly different than treatments 17, 18, or 19. This result may indicate that the combination of QP Chloro 720 plus Myclobutanil is the weakest of these combinations on gray snow mold. * Note: If the difference between two treatment ratings on the same date is larger than the LSD value on that date, then the treatments are statistically different. For example Treatment 8 and Treatment 11 rated 7.0 and 6.1, respectively, on March 9th. Since 7.0 – 6.1 = 0.9 and is greater than the LSD Value (0.7), the Treatments are statistically different. But Treatment 8 is not statistically different than Treatment 13 on the same date since 7.0 – 6.3 = 0.7 is not greater than the LSD (0.7).